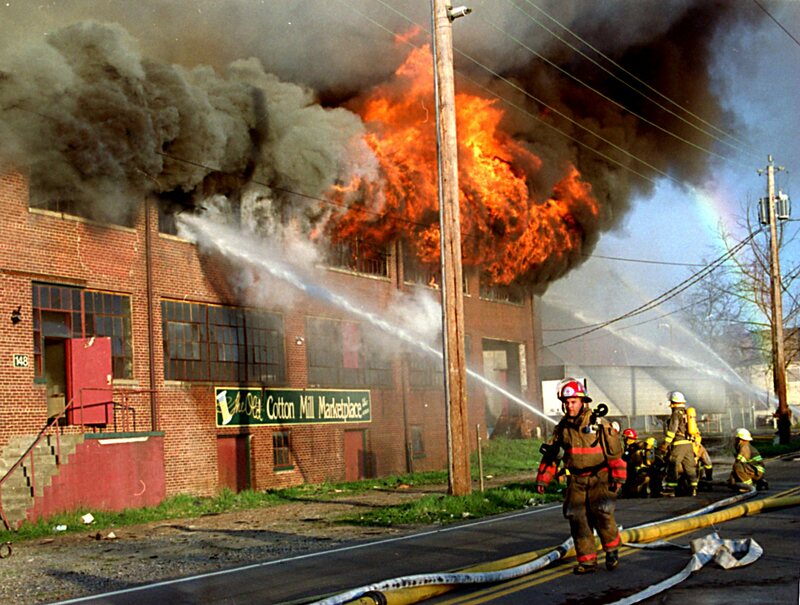 Asheville Citizen-Times photo/ Fire crews battle a blaze at the old Asheville Cotton Mill on Riverside Drive on April 2, 1995. 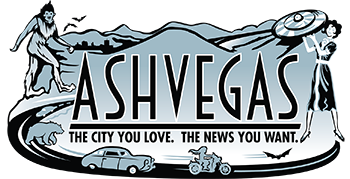 The Asheville Fire Department was dispatched to a structure fire at 4:13 a.m. at 159 Riverside Dr. Crews arrived on scene to find the building, known as the Cotton Mill, to be fully involved. The fire was knocked down by 6:03 a.m. Crews remained on site to complete overhaul and to monitor hot spots. By 9:37 a.m., all units were cleared. The investigation into the cause of the fire is ongoing. There were no reported injuries to firefighters. At this time, there are no known injuries to civilians. A ravenous fire fed by a gusting wind Sunday afternoon devoured two historic buildings along the French Broad River near downtown Asheville and touched off several other smaller fires. The fire destroyed the four-story Earle Chesterfield Mill and severely damaged the old two-story Asheville Cotton Mill, which contained several small businesses. The cotton mill is easily identified below the Smoky Park Bridge by its water tower. Sparks flying from the warehouse fires also ignited smaller fires at an ice storage warehouse, Lee’s Transmission and Asheville Waste Paper Inc. on Riverside Drive. About 150 firefighters from about 20 fire departments battled the blaze. Asheville Fire Department Chief John Rukavina said Sunday night that no one was injured. Rukavina said the fire caused at least $1 million in damages. The fire started about 3 p.m. in the Chesterfield building, he said. Rukavina declared the fire contained at 6:41 p.m. Firefighters won’t be allowed to investigate the cause of the fire until sometime Monday, he said. “This is the nightmare firefighters have been living with,“ he said, as huge clouds of smoke billowed from the buildings.